MUSLIMS GET THE BOOT FOR PRAYING TO ALLAH AT EMPIRE STATE BUILDING! The couple silently knelt in an isolated area of the Empire State Building’s observation deck, according to court documents. Pray to our God or GTFO!!!!!!!!! THIS IS THE USA AND YOU WILL PRAY TO OUR GOD-NOT YOURS! 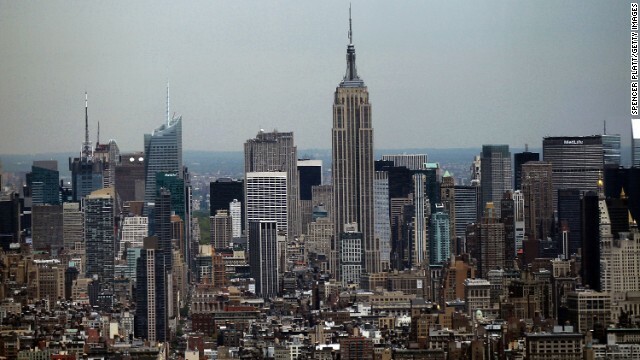 New York (CNN) — A New York family’s hope for an enjoyable outing high atop Manhattan ended abruptly when the group was escorted out of the Empire State Building for saying Muslim prayers, according to a lawsuit. Fahad Tirmizi, his wife, Amina, and their two young children were at the skyscraper’s observation deck last July 2 shortly after 11 p.m., a time when the family’s “religious beliefs require them to recite the evening prayers wherever they may be at the time,” according to a lawsuit filed in Manhattan District Court on Tuesday. The couple silently knelt in an isolated area of the observation deck, with little foot traffic, the court document said. While she managed to pray without incident, one guard interrupted and “menacingly poked” Fahad Tirmizi “with his hands and feet several times in various parts of his body,” the court document said. The guard informed Tirmizi he was not allowed to pray while at the observatory, and then “forcibly” escorted his family to the ground floor exit of the building, according to the court document. PRAY IN YOUR HOME-PREFERABLY FROM THE SAND DUNES YOU CAME FROM-YOU AREN’T PRAYING TO GOD – YOU ARE PRAYING TO ALLAH-AND WE KNOW WHAT THAT’S ALL ABOUT!